This summer I completed another book cover for Cruachan Hill Press. This one is for "The Catholic Middle Ages: Readings and Questions, A Primary Document Catholic Study Course" by Phillip Campbell. 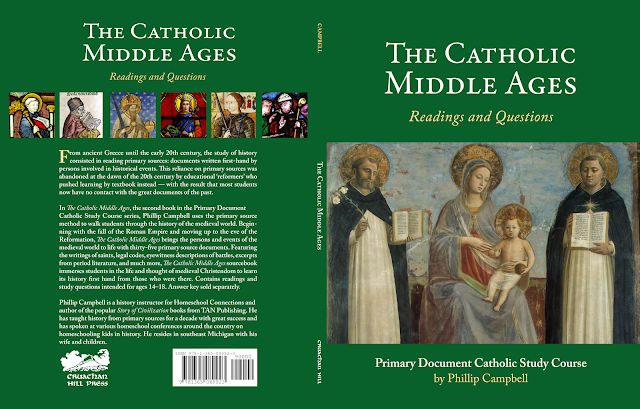 "In The Catholic Middle Ages, Phillip Campbell uses the primary source method to walk students through the history of the medieval world. Beginning with the fall of the Roman Empire and moving up to the eve of the Reformation, The Catholic Middle Ages brings the persons and events of the medieval world to life with thirty-five primary source documents. Featuring the writings of saints, legal codes, eyewitness descriptions of battles, excerpts from period literature, and much more, The Catholic Middle Ages sourcebook immerses students in the life and thought of medieval Christendom to learn its history first hand from those who were there."